Hiya, everyone! 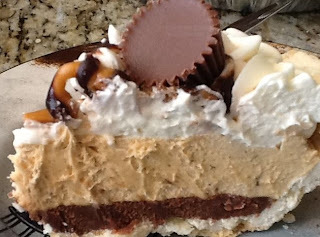 It's my pleasure today to welcome Leslie P. Garcia to the blog! 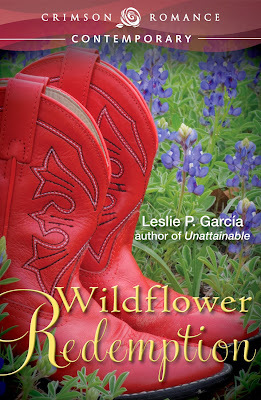 Leslie is sharing an excerpt from her new romance Wildflower Redemption ... after I ask her some deep, deep questions, that is. Okay, lets get to it! 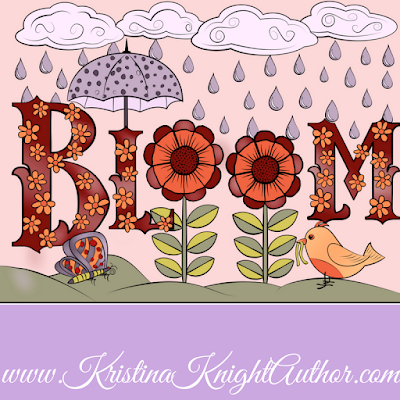 Kristina: What do you wear when you're writing? Leslie: I’d like to create a glamorous me, and say a slinky nightgown, but I’m ususally wearing the last clothes I had on when I walked in the door from somewhere else and sat down to write before running some other errand. Often a smock top and polyester pants. Sometimes an old tee shirt that’s really long. Sometimes…never mind. Not a pretty image! Kristina: Ha! I know what you mean - some days I feel like a fashion maven when I manage to wear jeans instead of track pants! When was the last time you argued with one of your characters? And were you caught by a real person? 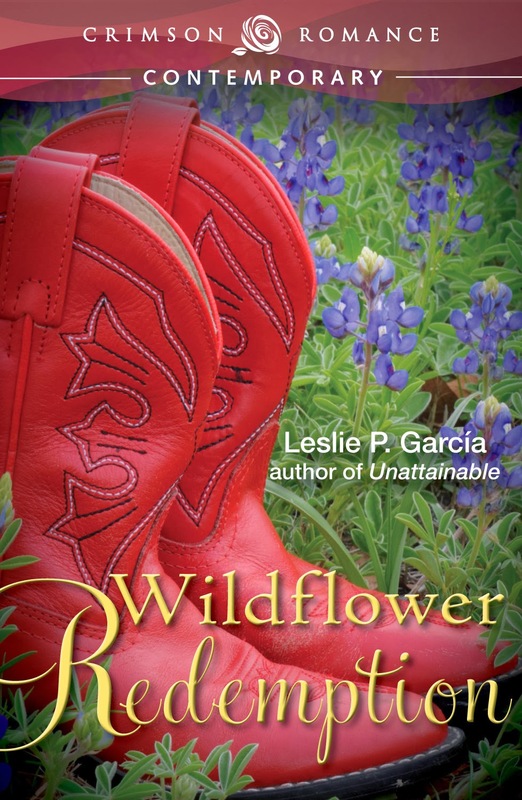 Leslie: I’ve been arguing with Esmeralda Salinas constantly—she’s the heroine in the second book of Texas—Heart and Soul, a follow-up to Wildflower Redemption. She doesn’t want me to win on anything. Just hope she gets where I need her to soon. The last time I got caught, though, was years ago. A guy I had a crush on-illicitly, because I was married—kept catching me laughing my head off because my poor Anglo girl and her Mexican husband (not anyone I knew!) were driving me crazy. The w-i-p was called Papers, and I wish I’d finished it. But the taco stand’s boss’s son thought I was crazy. So did my husband. Kristina: That is too funny! (PS: I have an Esmerelda character too...and she was a tough nut to crack!) How do you keep gremlins – like your family – out of your office/writing habitat? Is there a way to do that? Leslie: Actually, my grandkids are mostly gone, my daughter’s old enough to respect my need for privacy—and is afraid if she comes in I’ll be singing—and I lock the door if I have to keep my husband from asking where things are. Only the beagle bugs me. Kristina: Ah, my bugger is an American Eskimo. Oh, and a 5 year old. Oh, and RadioMan. But they know when to give Mommy a little space. : ) Have you ever taken your frustrations with the Real World out on your characters? Leslie: Yes, but not successfully, so when I do—I have to re-write. The one exception would have been the aforementioned work, Papers. Do you know how hard it is to acquire a visa for a foreign born husband when you’re a wimp? Papers attacked pretty much everyone, and the heroine was me. Too bad the story never happened. Kristina: If you could be one character from this book, who would it be? And why? Leslie: As much as I like Lillie Mae, I don’t want to be eighty yet, so I’d have to opt for Esmeralda Salinas. She loves horses, is drop-dead gorgeous and can do things I can’t—sing and enjoy male companionship, but is smart enough to recognize the real deal when she sees it. Kristina: Sounds like some amazing characters, Leslie! Thanks for coming to visit me today ... and, readers, keep going for your peek into Wildflower Redemption. You can’t have it all. At least, not forever. Luz Wilkinson learned the hard way that balancing a career, marriage, and motherhood can end in absolute destruction of heart and soul. When the biological mother of her daughter tears the child away and ruins her reputation, Luz goes home to tiny Rose Creek to rethink life and ambition. She surrounds herself with discarded animals and plans never to care again. Widower Aaron Estes lives for his daughter, Chloe. Fleeing from the horror of losing his wife in a school shooting, Aaron stops in Rose Creek on a whim and a random act of kindness from a gas station clerk - not a lot to build a life on, but a momentary redemption from his sorrow and fears for his daughter. Prompted by counselor Esmeralda Salinas, he takes Chloe to the Wilkinson place for therapeutic riding lessons, and finds Luz everything he wants in a mother for his daughter - but Esmeralda’s open pursuit is a problem. Burned by her divorce, Luz refuses any relationship involving another woman or a man with another woman’s child. Unlimited love for their children comes easily - but will they ever be able to conquer past pain and love each other? “And something’s wrong!” she snapped. “Stay here with Chloe! I’m just checking for anything that might have set the dog off.” She bit back “again.” As she rushed outside, she couldn’t help wishing she’d had the dog on a leash— and her mother’s pistol in her hand. She went around the side of the house, tripping once on a rock hidden in the shadow the house cast since the security light was on the other side. In the front yard, she stopped and peered out toward the road, where she could make out the shape of a dark car moving slowly along the fence line. Tires screeched and taillights glowed as the car suddenly accelerated and sped away. Not Ross Thurmond’s truck. The thought surprised her. Worried her. How had his brief, strange, visits here unnerved her like this?And then sudden suspicion hit her. Hard. Mention writing to most first grade students--or teachers--and everyone runs from the room, screaming or crying, respectively. I, however, love the challenge of convincing the technology kids of today that words create everything they use, everything they enjoy. Yes, even those horrible cartoons and video games that are so foreign to me now. And the songs. I, myself, was a published writer in first grade, first by the school principal, then by a novel but short-lived magazine written entirely by kids. I still remember the title: Kids. Paid me $1.50 for the last rhyming poem I ever wrote. "Dolphins are nice though they don't like ice" something something. Luckily, my poetry no longer rhymes, and my stories strive to portray the mishmash of cultures, events, characters, and times that are our lives--all our lives, even if not everyone had a lion or a roadside amusement park or hid in an arroyo on their wedding day. There's a circuitous route through most of our lives, and the publishing company that helped me learn to submit work for publication through their magazines and annual Writers Market, F&W Media, has published my three most recent works. A lifetime of words away from first grade, but hopefully, you'll enjoy my words. I love hearing from readers, and hope you'll visit me one of these days. Because words still have power, and always will. Love this book! Get your copy ASAP! Thanks D'Ann. (lol!) I appreciate it! Hi, Leslie, thank you for being my guest today! I'm nearly finished with Wildflower Redemption - loving it so far! Thanks for having me, Kristina. Glad you're enjoying Wildflower! Thank you sooo much, Kit! I really appreciate it. Hi, Kit! Thanks for stopping by!